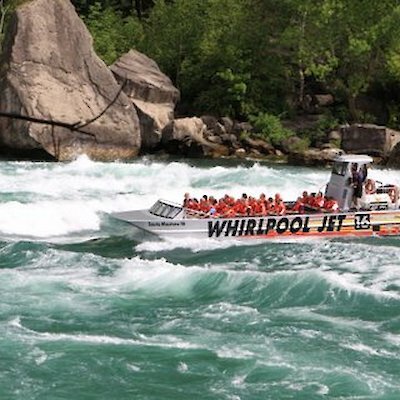 It seems like only yesterday, and not the 21 years that it really is, that John Kinney owner and operator of the Whirlpool Jet Boat Rides pitched The Niagara Parks Commission to gain support for his new thrill ride. He was turned down a few times but his determination eventually won out and the support was granted. Today, this one hour popular high speed ride into the Niagara Gorge is still as popular as ever. His custom built fleet of jet boats has an explanatory record of safety. The wet, wild and wonderful attraction recently for the season opened on the Canadian side of the border at Niagara on the Lake. On May 4th the operation opens on the U.S. side of the border at Lewiston. 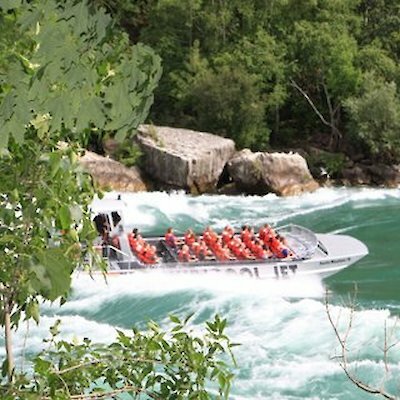 Here’s just a partial list of celebrities who braved the Niagara Rapids on this spectacular jet boat adventure; media personality Regis Philbin, American singer Harry Connick Jr, actor Ray Romano, Joe Perri, lead guitarist for Aerosmith and actress/singer Mandy Moore. Attached are a few photos I took of the Jet Boats going through the rapids as seen from the Niagara Glen on the Candian side of the river.